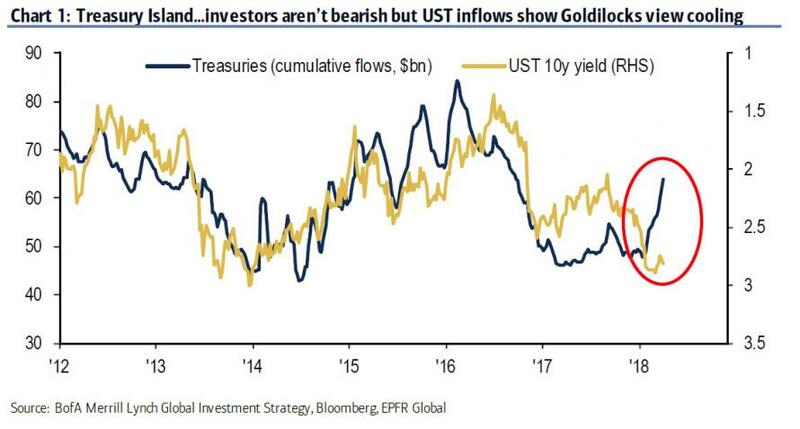 According to Hartnett, these Treasury inflows "are the most visible expression of positioning for risk-off to date." 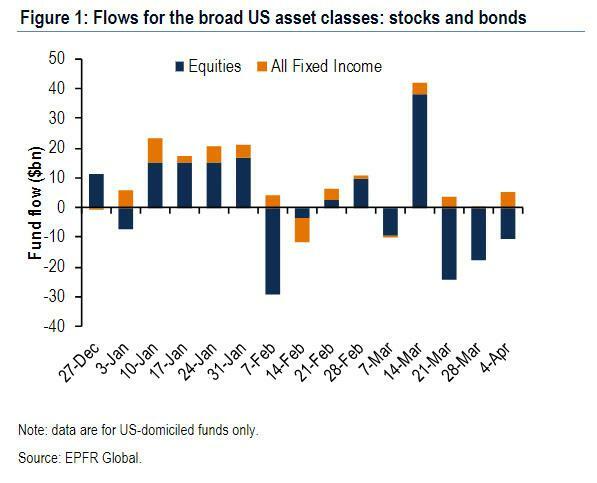 That said, not all remnant of the risk-on trade are gone: investor infatuation with emerging markets continues, and in the week ended April 4 there were more inflows to EM debt & equity funds ($5.4bn). 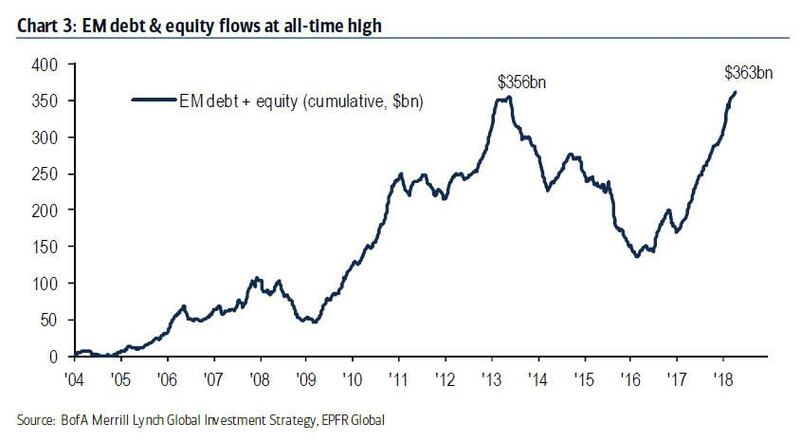 Surprisingly, the cumulative EM inflows are now at an all-time high of $363bn. How to explain this relentless EM bid? 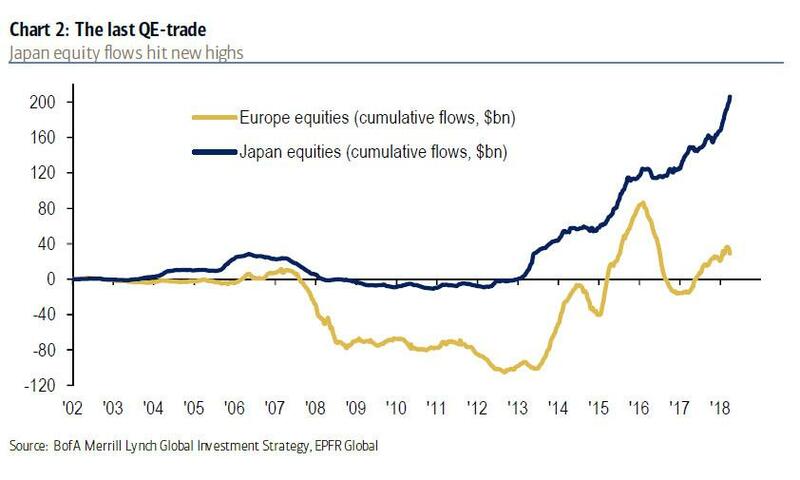 To Hartnett, the inability of the 10Y to break 3% plus the stubborn US$ weakness "helps explain EM resilience to rising trade war concerns." That said, a few more days of trade war fears on full display, and the unwind of the EM will make the recent bursting of the crypto-bubble seem like a gentle stroll in the park. vol, credit, stocks, tech all corroborating simple fact that Fed well into a tightening cycle in ‘18, profits peaking; but US$ is not…on contrary, spec positions very long Euro; best “pain trade” now long US$, short EM (chart 4); DXY requires protectionism to hit PMIs and/or surge in wages to break decisively higher (i.e. >91). And as we showed earlier this week, PMIs are already getting slammed bigly, and protectionism was the key factor cited. 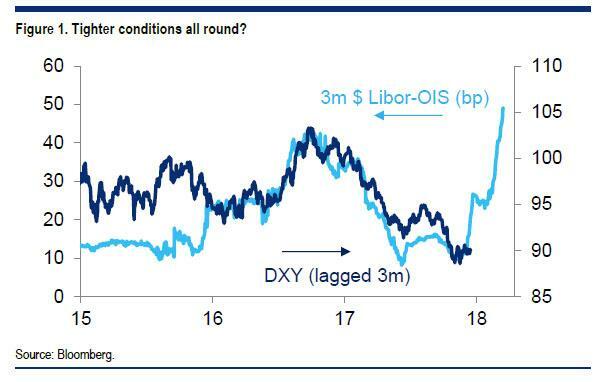 As for the real catalyst for a surge in the DXY - and a crash in risk assets - look no further than this chart from Citi of the blowing out Libor-OIS and the lagged DXY for a sense of the "pain trade" that is coming next.